Can you tell I'm packing for a picnic? Cabbage is always on sale in March. If you like vinegar-based coleslaws, shred an extra head for this easy freezer recipe. I cooked a pound of dry beans in leftover chicken stock. Now I have one 24-oz container to pop in the cooler, with two in the freeze for future meals! More: bulk cooking and freezing rice for convenience. I never knew you could freeze cabbage! Enjoy your picnic! I awoke to first day of spring snow!! I freeze just about everything, but I never considered making slaw! Thanks. I'm going to give this a try. How is the texture of the cabbage after it's been frozen? So, I take ground turkey and split it for two meals - one batch for chili - and one for enchiladas - freeze it with label on front and bam - pop in microwave for a melt down and dinner is quick and done. Makes mama's life a lot easier! Thanks for your inspiration sister meredith - it goes a lonnnnng way - even to the pacific northwest! My mother-in-law gave me a recipe for freezer slaw, but I haven't tried it yet. In fact, I had never even heard of it until she gave it to me. I think I just might have to give it a try now. 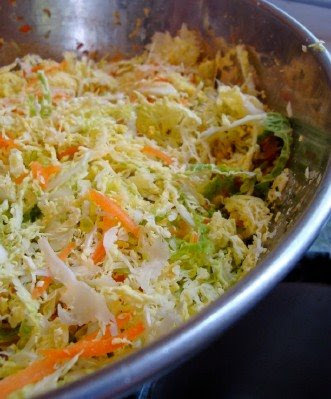 The coleslaw looks delicious! I am always looking for good vinegar-based ones because my DH doesn't do mayo-based anything. Thanks for the tips. 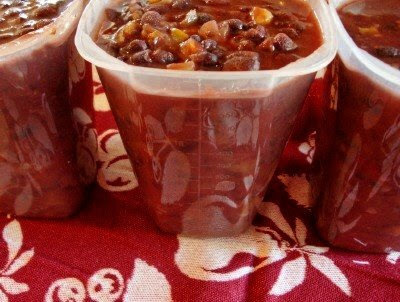 I have wondered for a long time if beans would freeze well, now I know and will give it a try. The texture is crisp and crunchy. Maybe a little softer than fresh made, but a lot depends on how finely you chop the cabbage. I always buy cabbage on sale and then it makes so much cole slaw that we can't eat it all (and we just get tired of it before it's gone). I'll definitely try this recipe because I'm all about vinegar and can't stand mayo! Thanks for sharing.